This morning I'm going to open up a blaster of O-Pee-Chee. This product is geared toward collectors who want a retro-style break. OPC really does a good job of giving collectors a taste of what it was like to buy cards in the 80's and early 90's. It's not a product that will net you a huge hit, but it is a product that will give you a fun pack busting experience. OPC has been around for a very long time and is known for its enormous sets. In fact, the packaging boasts that the set is 600-cards large. That's a huge set! Being that big, the set is a challenge to build and some collectors make the effort to put it together. For older collectors that may be returning to the hobby, OPC will bring back a nice, familiar feeling. It's not that OPC is not without its hits. It is advertised that you can find signature cards inside the product. A quick look at the odds is a little discouraging though. Signature cards come 1:800 packs - those are pretty long odds. So it's pretty unlikely that you'll find ink the the standard blaster of OPC that you pick up. Rather than hope for a hit, I suggest enjoying the variety of inserts and parallels found inside OPC. The brand is packed with mini cards, stickers, and parallels to find. Many of these cards have fun designs that are really appealing to the eye. This OPC blaster gave me pretty much what I expected. By far my favorite cards out of this break were there sticker cards. I was able to pull some names that I really liked out of of the box. My parallel cards - both retro and foil - were nice too. With a huge set of 600-cards, it can be hard to get parallel cards of star players. It was sweet to get an Erik Karlsson retro card and a Henrik Zetterberg foil out of this break. Other highlights from this blaster was a retro rookie card and a foil standard rookie card. The box also put out a nice variety of legend cards and rookie cards. Unfortunately, OPC is a product that comes out before the start of the season, so none of the big name rookies from the 14/15 season are included. 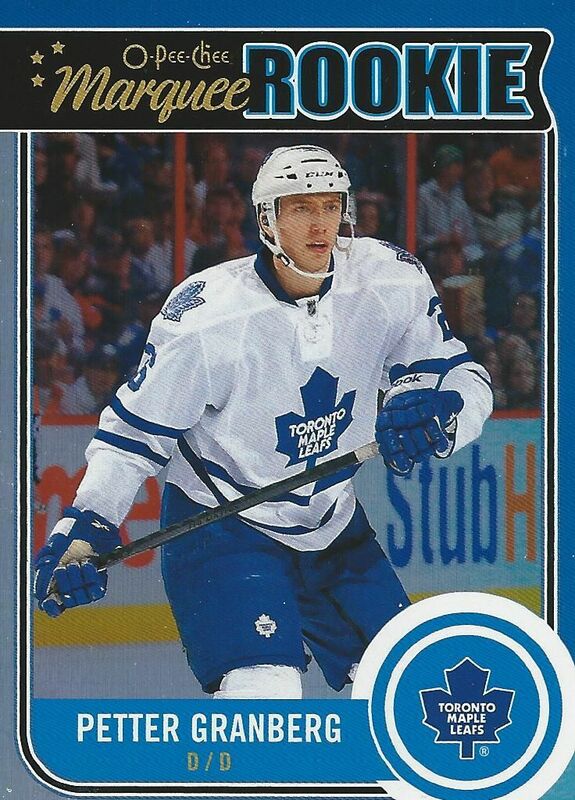 Collectors have to wait until Upper Deck Series 2 to find those cards as updates. My reason for picking this card in my top three is solely for its good looks. The blue foil on this card really shines nicely in light. This year's Marquee Rookies have a great design, and they look much better with foil. Also, it's interesting that Petter is spelled with two T's. 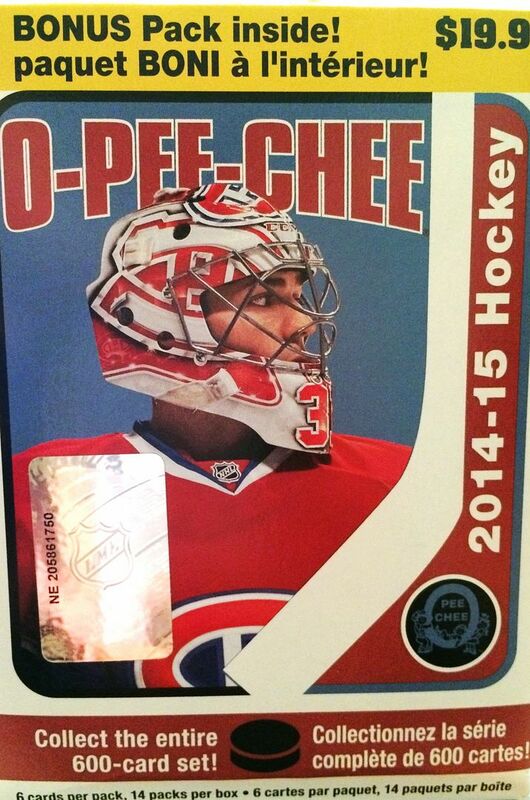 The Dominator is one of my all-time favorite goalies, so getting his cards is always good for me. I prefer him in Sabres blues, but he had a lot of success as a Red Wing so I understand why many of his cards have him in those colors. 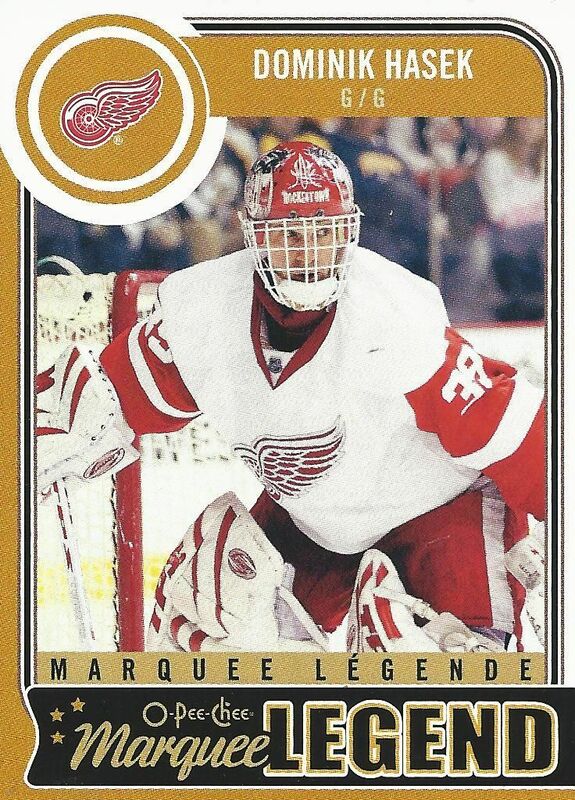 Another favorite goalie of mine is Irbe. 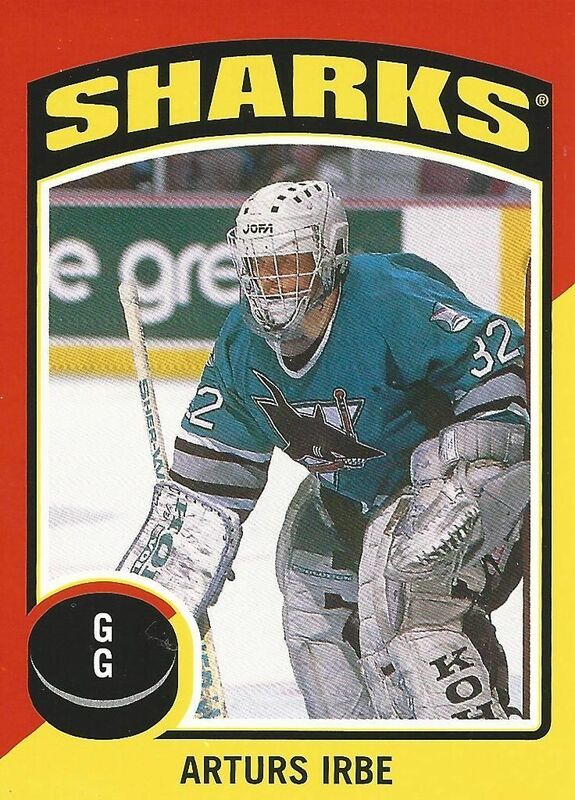 He was the goalie for the Sharks when I started following them way back in the 90's. This card has all sorts of win for me as the colors and retro-ness of it is oh-so-appealing. I just love this card! Going into this break I didn't expect much, and with those expectations, OPC over-delivered a little by giving me a really fun box breaking experience. As a collector that really focuses on hits, I am reluctant to purchase OPC a lot of the times, but every time I bust open a box, I never really regret it. If you haven't gotten some OPC in a while, I think it'd be fun to crack into some just for kicks. OPC is a quality set with a good deal of fun within it.